An evening we were invited to dinner in the small village of Saint Genis-Pouilly resting on the giant CERN-facility. As many other, my friends there are working in one of the many international organizations located in Geneva, and has settled not in Switzerland, but across the border in France. I was invited to dine in a lush garden, and my friends did not save on anything. A delicious starter, a main course accompanied by two great wines. Here is what we enjoyed in the garden of Saint Genis-Pouilly. The starter was small mozzarella and cured ham packages. 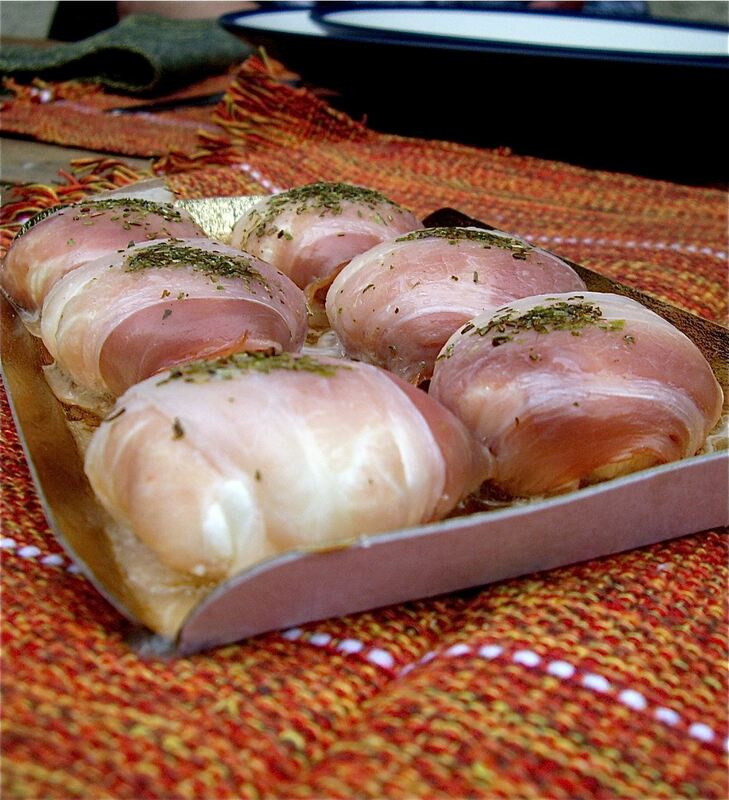 A great idea, really as the mozzarella has a mild, neutral taste and will turn deliciously runny, but will keep its shape when baked in the oven. The taste of the cured ham will get more concentrated when baked in the oven, creating an ineresting contrast in taste and texture. The dried herbs sprinkled n the top of the small bundles creates more interesting aromas. My friend Mara had prepared a boeuf Bourguignon as main course - a great choice for a main course, and very appropriate as Burgundy is just a few hours away by car. 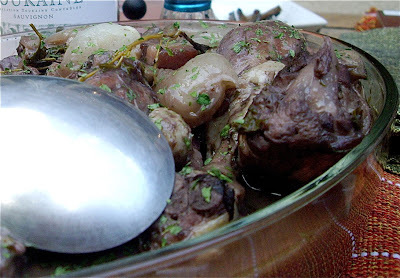 Beef, garlic, onions, root vegetables and herbs immersed in wine and stock and simmered until the meat was so tender it just fell off the bones. In this process, all flavours change and developed into a mysterious blend - real culinary alchemy. This Bordeaux wine was served to our starter. Château du Garde came from the denominated area of “Côtes de Bordeaux” and “Bordeaux Superieur” in the heart of Cénac, 15km away from Bordeaux following the Garonne river south-east’s bed. 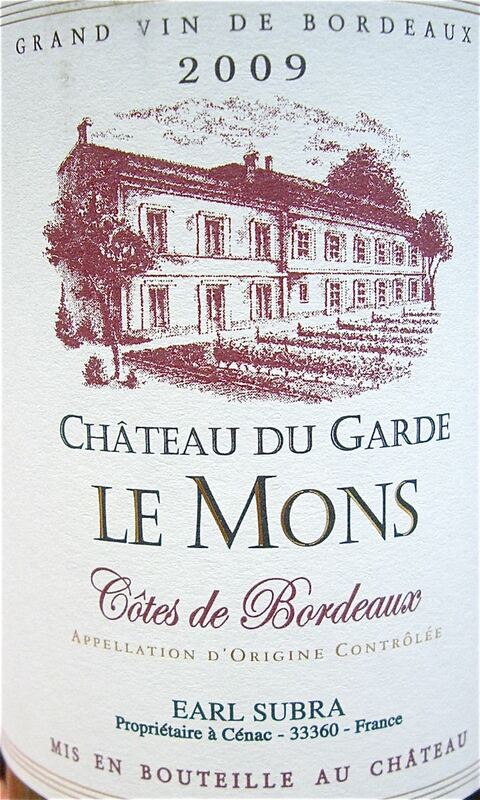 Red wines from Chateau du Garde is made from Merlot, Cabernet Franc and Cabernet Sauvignon grapes. Chateau du Garde proved to be a brilliant claret. 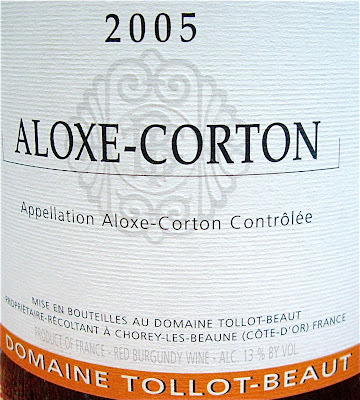 Aloxe-Corton wines are produced in the communes of Aloxe-Corton and Ladoix-Serrigny in Côte de Beaune of Burgundy. This wine was served to the main dish, and came from the vintage of Domaine Tollot-Beaut and sons.